Surprisingly I have forgotten to record the purchase of a Trix Twin (TT) 0-6-2T tank loco earlier in the year. Now buying TT locos is a tricky business. Pre war and early post war were 14 volt AC which, like Marklin will run on HD track but won’t reverse but , more importantly, they all had large flanges on their wheels and will not run through HD points. In 1957 they moved to 12 Volt but still has “cheese cutter” wheels. However they then started producing “scale” wheels which can be used on HD track with points. They also seem to have made “convertible” wheels but what they are exactly I am not sure. I bought my loco from Steve White, www.trix.co.uk/ , who offered it at a very fair price and gave me excellent support. The loco is the Trix equivalent of 3 rail but nowhere near the same as HD. The wheels are insulated, the loco picks up power from two side pick ups and returns it through the centre pick up. Getting the side pick ups to run through HD points took a lot of careful adjustments but was finally successful. This engine therefore has 3 pick-ups and this extra friction does restrict it’s load carrying capability but it is a good smooth runner with a couple of carriages or a short goods. The second picture clearly shows the outrider pick-ups. I am basically a Southern man and I like green BR(SR) carriages but these are so expensive. Boxed they go for £70 plus and unboxed still fetch £40 plus. I do have a 3 carriage rake of them pulled by my Dorchester but more would be nice and that is where Trix comes into play. They make some very nicely detailed BR(SR) green carriages, which of course have peco coupling and therefore fully compatible with HD. They have plastic sides rather than the tinprint of the HD ones but do match the Pullmans which were all plastic. They also make a Buffet car which fits in nicely. My buffet car has had it’s bogies replaced with HD ones but I fail to see the reason. The original bogies on all the other carriages run smoothly through points, reverse with no problems into sidings so why bother to change them as all it does is make the carriage run a little higher. The really good news is that this rake of 2 composite and one 1st/brake cost me £20 plus £4,99 postage as a “Buy it Now” and they were in very good, unboxed condition and look great running behind my Schools class and 2-6-4MT’s both in black and Southern Green. 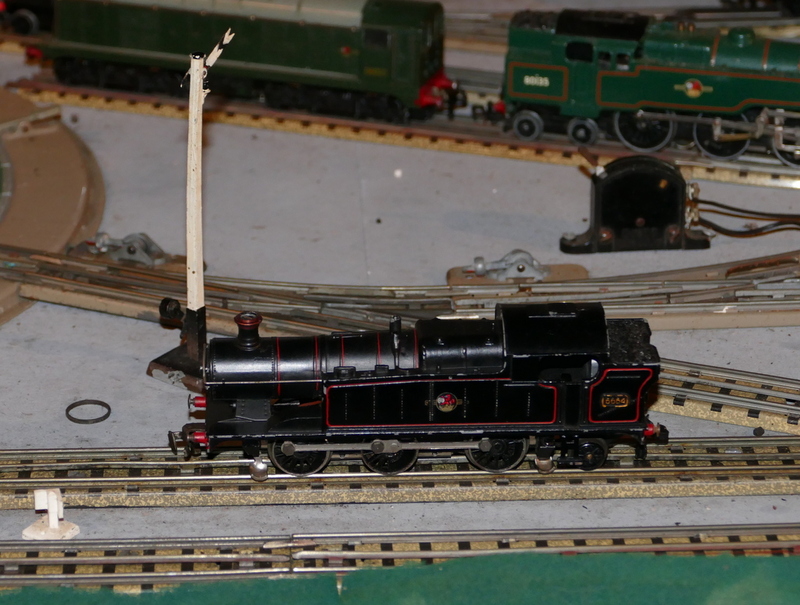 They are obviously incorrect as Southern carriages but they are welcome on my layout – the colour counts. So if you want cost effective and very smart, good running carriages I don’t think that you can go wrong. I have all I want so you won’t be outbidding me at least. Hi, you asked what Trix convertible wheels were.In the 1960s,British Trix supplied locomotives,the EM1 being a case in point,with convertible wheels.These were supplied with scale wheels with a plastic rim which deepened the flanges to be able to run on Trix bakelite track.To convert to scale to run on HD 3rail track,you simply cut them off,however,the process was not reversible. Hi Tony, as Ray mentions the convertible wheels had plastic rims, I don’t have the EM1 but my Standard 5 did which I took off 30 odd years ago. After cutting them off it did leave an extra ridge on the backs but it was not low enough to cause any issues (if it had the exercise would have been pointless). The later Britannia’s were also fitted with these but I cannot say how many others were. They are easily spotted though. As you are a Souther Railway enthusiast, you might like to keep an eye on ebayuk listings foe Exley carriages in Southern green. I’ve got a pair that are used on the engineering department trains, a brake-third and a full brake, both green. We are LMS so have maroon for passenger services.